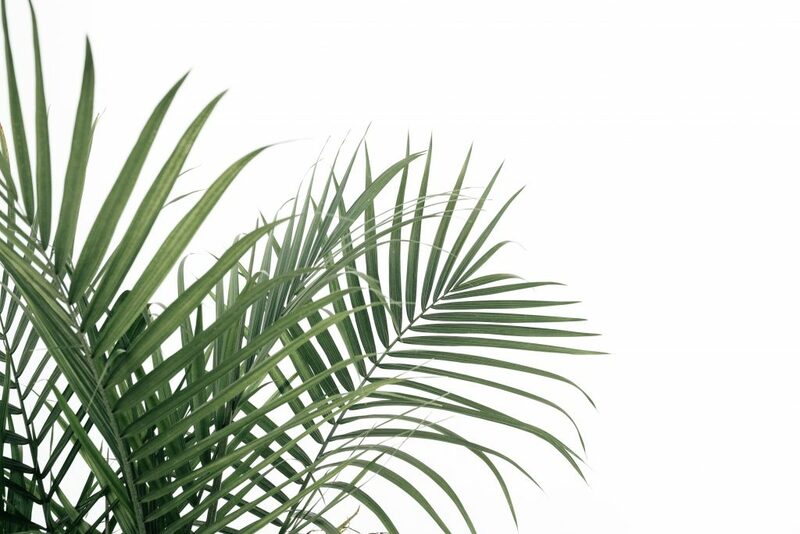 Next Sunday is Palm Sunday, the day that marks the joyous entry of Jesus into Jerusalem. As in every other occasion of his earthly time among us, our expectations are reversed, and we are surprised again by a world turned upside down. It was not a warrior’s stallion that bore Jesus through the gates and over the cloaks and palms strewn across his path. But rather, a donkey. This divine reversal was one of many. Certainly, a king would be born in a palace, right? A birth announcement made to the Senate, greeted by delegations of the political class? Oh, no. This king was born to an obscure teenage girl, huddled in an animal shelter with news of the event told to sheepherders, followed by troops looking for a child to kill. Certainly, this rabbi would preach about victories, health, and prosperity, right? Not quite, but the meek, grieving, and poor listened closely. And a few days after the cheering throngs welcome him and his donkey to the capital, Jesus took off his cloak, knelt down, and washed twelve pairs of feet. When we are in pain or are in fear of death for ourselves, or (worse yet) in fear for the life of someone we love… when we are in mental anguish, unable to act or sleep, feeling forgotten and abandoned… when we feel least like the whole and wonderful person we know we were once, it is then that the manger, the donkey, the sermon, and the wash basin should all remind us of one important truth. Jesus came looking for us. It is alright to be low. It is alright to be humbled. In fact, there are times when those are the best things to be. When our own world is turned upside down and all we can sense in ourselves is weakness and disappointment, that is when we are closest to the loving God and the miraculous strength that we can call upon. Conversely, when things are going swimmingly, and we bestride this narrow world like a Colossus, that is when we should be on the spiritual alert. Not just because things in life can turn around suddenly and bite us someplace painful—(a dramatic reversal of fortune that Aristotle called peripety)—but because our dials should always be tuned to the Humility setting. With the needle set to Humble, we not only become more aware of our shortcomings but we can more clearly see the needs of others. And by love, he is not talking about the super fun kind of someone you just saw from across a crowded room. Jesus is talking about devoted service and sacrifice. You have suffered. You know what you needed when you were trying to claw your way up from the bottom. Be to someone else the person that you needed. Remember that we belong to each other. So needed to be reminded of this… thank you! Wow! That just floored me. Tears are in abundance – Jesus came looking for me! Kate, my husband is in crises hospice as of today. I was raised Catholic, parochial schools, as an adult I have a strong contemplative practice through Buddhist studies. But your post today got my tears to finally break the surface and flow. I’m so grateful for your effort to assist others! I’m a fan. Thank you for writing. This is amazing. Thank you, Kate. So beautifully stated….love your wisdom and insight. Thank you for this message today. Kate, thank you so much for this. Your message is a wonderful way to start my day. Thank you for reminding me to be the person I hoped would be there for me when I am so needy of help and love. God bless you! You speak directly to my heart. Oh, Kate, thank you for this reminder. So beautiful. Thank you Kate. With the needle set to Humble, we not only become more aware of our shortcomings but we can more clearly see the needs of others. 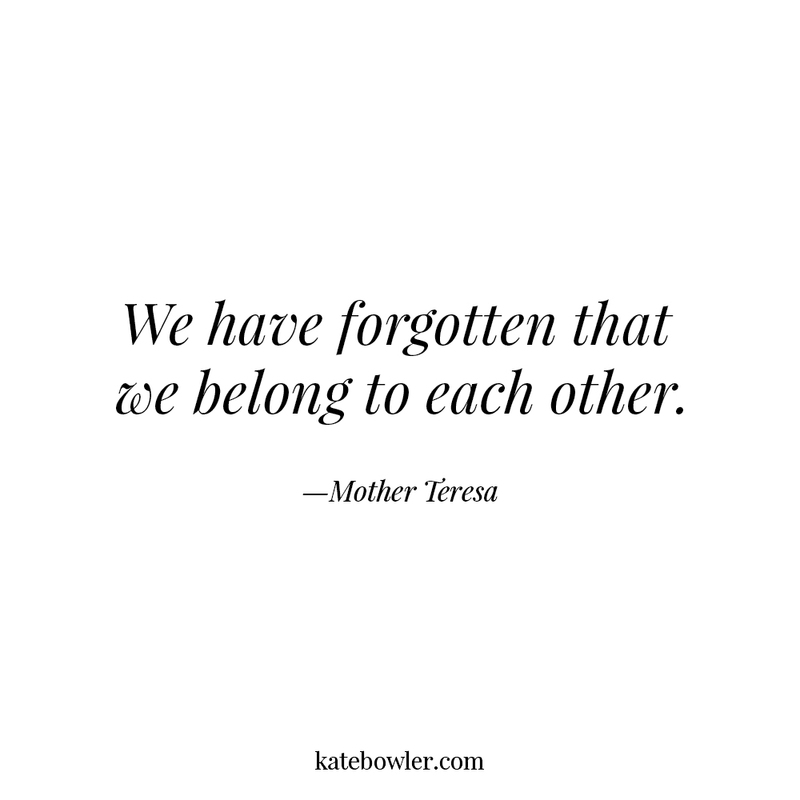 I love the Chesterton poem, and Mother Teresa’s gentle reminder that we all belong to each other. It’s too easy to forget that simple message if we’re blinded by our own difficulties. Thank you, Kate. I am blessed to be a pt at Duke Oncology. Your writing is such a blessing. Thank you. This was just the reminder I needed this day. Comforting and inspirational words. Thank you so much and God Blees. We owned a donkey much like the one in Chesterton’s poem, and we live among rattlesnakes and spiders. We made it through a killing winter, only to face the flood waters erasing the roads and trails we need to get to wherever we are going. And yet, the sun has broken through the bleak sky, and for now, I am here. You are there. And we belong to Something together. Thank you for sharing, so good. Some excellent thoughts. The donkey’s poem is great. One typo–“manger” came out “manager” (second paragraph after the poem). Probably your word processor’s dictionary sees manager being used more than manger! abandoned…and of desperately ‘thirsting’ for relationship renewals, this devotion brought a stirring deep within my soul….that in my state of feeling continually anxious and fearful (as a Christ follower I should know better, right?? ) 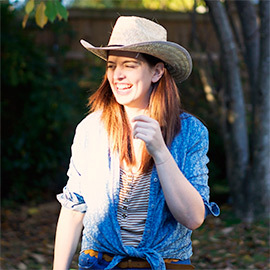 , He loves me as I am…not as I should be (Brennan Manning). Thank you, Kate, for these meaningful words. Let us not forget our desperate times and devote ourselves to those who need us. I really appreciate all that you are doing and sharing with us how to love and live the life we’ve been given. Thank you for your work on the history of the prosperity gospel. 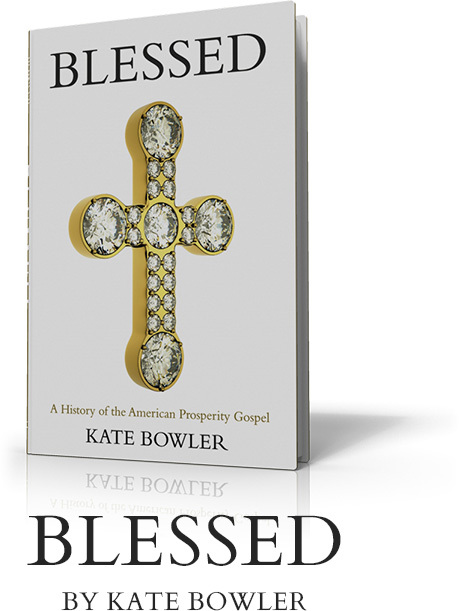 Our paths crossed when I checked out your book “Blessed”. What an amazing thing you have done! I am praying for you. Beautifully stated and so needed in this day. Blessings to you. Your words and your presence on this earth are a blessing to so many. Thank you. Beautifully said, Kate. Such a timely reminder for me. Thank you for the gift of your insight, your wordsmith, for sharing your journey with us, and reminding me of the sacred worth of my suffering. Blessings. 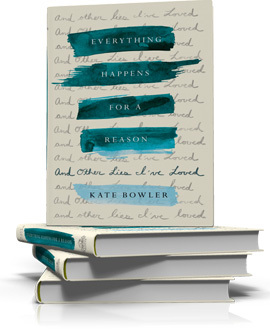 Be blessed, Kate Bowler, for you are a blessing. What a gentle reminder that we are to be servants. I await your net meditation. Thank you so much. I needed to read this today. I share your posts with our minister at our church. Blessings! 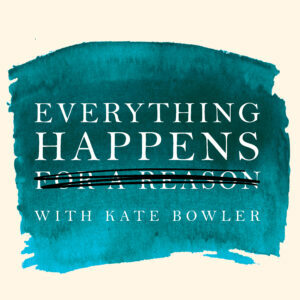 i am so appreciative of these posts – the audio as well! and they have really resonated with my soul. Thank you, Kate! Thank you so much! This is just the message I needed today. You make me cry happy tears, Kate. Thank you for your words. Thank you, KB. I love your voice and your reflection. Peace and best wishes. What a wonderful meditation! Thank you. Oh, thanks for these holy and beautiful words! Kate, your words are always so insightful, inspired, and amazing. Thank you. Since I am a caregiver to my grandchild with cancer, people say to me,” I do not know how you do what you do.” It’s with humility and God’s presence in my life. As we head today to her checkup , I feel the apprehension in my heart. Thank you for reminding me today about the miraculous strength I need to call upon on days like this. Thanks Kate, this is very timely for me. Simply “WOW”. Beautiful Post. Important Reminder. Thank you Kate, G.K., and the brave donkey for showing me the way! As always, thank you, Kate. Though I try to be mindful, I am sure I do not practice love and gratitude enough. thanks for the gentle reminders. Thank you for teaching me a new word, peripety. Nice to know there is a word for this universal experience. Makes one feel less lonely. Funny that the word itself feels happy like “Mary Poppins”. Try repeating it a few times. Love the humility meter. Yes, we are in control of the dial and need to be reminded to set it correctly. “Thank you” feels woefully inadequate right now, but it is sincere and, yes, humble. You have shown us the face of Christ today, Kate. Thank you. Stunning. Thank you and Amen. You have touched my heart and spurred me on.